Kerry Seeks Close Review Of Afghan Troop Request Al-Qaida's presence in Afghanistan and Pakistan's stability are the principal security concerns of the U.S., says Sen. John Kerry (D-MA), chairman of the Senate Foreign Relations Committee. He says, however, a request for additional troops should be reviewed carefully because poor Afghan governance is undermining the U.S. counterinsurgency strategy. Al-Qaida's presence in Afghanistan and Pakistan's stability are the principal security concerns of the U.S., says Sen. John Kerry (D-MA), chairman of the Senate Foreign Relations Committee. He says, however, a request for additional troops should be reviewed carefully because poor Afghan governance is undermining the U.S. counterinsurgency strategy. Democratic Senator John Kerry is among a key small group of people outside the administration who have president's ear on Afghanistan policy. Senator Kerry is chairman of the Senate Foreign Relations Committee. He joins us from the Capitol. Senator Kerry, welcome to the program. Senator JOHN KERRY (Democrat, Massachusetts; Chairman, Senate Foreign Relations Committee): I'm delighted to be with you. Thank you. BLOCK: How would you articulate what our mission in Afghanistan should be right now? Sen. KERRY: Well, I think the original formulation the president put out is accurate, which is number one you have to prevent al-Qaida. You have to disrupt and dismantle al-Qaida and prevent them from using Afghanistan as a sanctuary to plot and attack the United States. And secondly Pakistan and its stability is essential to our national security and it's critical concern. Those are the two principle driving security concerns of the United States. BLOCK: But obviously a lot of disagreement on how you do those things, are you convinced that more troops would make a difference? Sen. KERRY: Well, that's what we need to look at very, very carefully. I think, you know, we owe it to the troops. And we owe it to ourselves, to the entire country, to make sure that we know that exactly what we're asking them to do is in fact achievable. And I think that what's changed most recently is the deepening of the crisis, if you will, of governance in Afghanistan. The corruption and the inability of the government to deliver services undermines a counterinsurgency strategy. So, I think a lot of people want to measure exactly what is achievable against the request, that's all. It's a perfectly normal thing. Nobody should be getting agitated and excited about this. It's the proper role of the commander in chief to make that kind of decision before he sends troops into harm's way. And we've learned historically, you know, I remember President Johnson and, you know, Secretary McNamara and General Westmoreland, always asking for more troops without examining the underlying assumptions. We have an obligation to examine those assumptions, that's what we're going to do. It doesn't mean we won't send troops. It just means I think that we'll have a better understanding of exactly how we're going about what we're doing and what is achievable. BLOCK: And what about the strategy that has been advocated for by Vice President Joe Biden on - a purely counterterrorist strategy using Special Forces, say, Predator strikes targeting al-Qaida largely in Pakistan. Sen. KERRY: Well, I think Vice President Biden who - I had a long conversation with him the other day, I know is not - he is talking about some level of counterinsurgency necessary to be able to do the counterterrorism. The question really that has to be asked is: What is that appropriate level? How much can be achieved? What is possible on the ground in Afghanistan is a question that's got to be answered. The normal three-legged stool of counterinsurgency is development, security and governance. Right now, we have a deficit of governance to say the least. We've not been able to do the development because of the absence of security and the absence of security is linked to the deficit of governance. So, all three of those legs are wobbly to say the least. And what we need to do is figure out how we go forward here in a way that actually gets things done and changes the dynamics. I'm convinced that there is a way to change dynamics. We just have to settle on it. And obviously we have to accomplish whatever that goal is that we set. BLOCK: You keep coming back, Senator Kerry, to the questions that you think need to be answered. It seems, as public support for the war in Afghanistan continues to erode, people want answers now. They don't want to know just what the questions are? Sen. KERRY: Well, I agree. And that's exactly why I'm probing away. The Foreign Relations Committee is holding hearings. We've had a lot of these things aired, vetted in public. We intend to - we have another hearing this Thursday. We will have additional hearings. I don't think it's asking too much of our country to take a number of weeks here, to make sure we have the answers properly. I think it's very, very important, you know, before you send soldiers into harms way, you owe them a strategy that is commensurate with the sacrifice you're asking them to make. And I think it is critical for us. I think we have the right larger goals, but we've got to make sure we're implementing these pieces correctly. Nobody should, as I say, work themselves up into a lather over this. This is a - this is really what - what our good governance ought to be about. BLOCK: I don't know if he's in a lather but your Republican colleague, Senator Kit Bond, has said the administration is dithering on this. He says if we fail to provide troops now, it'll be too late. Sen. KERRY: Well, I've heard, you know, I've seen - as the saying goes, I've seen that movie before. I remember what happened when the president of the United States and the general in charge of the war kept asking for more and more troops and they never looked at the underlying assumptions. And we lost 58,000-plus young Americans and spent our treasure in the longest war in America's history. And it didn't turn out well. So I think it's important for us to ask these questions. And we owe it to our troops to make sure we're sure of exactly what can be accomplished and how. BLOCK: Senator Kerry, thank you very much. Sen. KERRY: Yes, thank you. My pleasure, thanks. BLOCK: Democratic Senator John Kerry of Massachusetts, one of a key group outside the administration advising President Obama on strategy in Afghanistan. 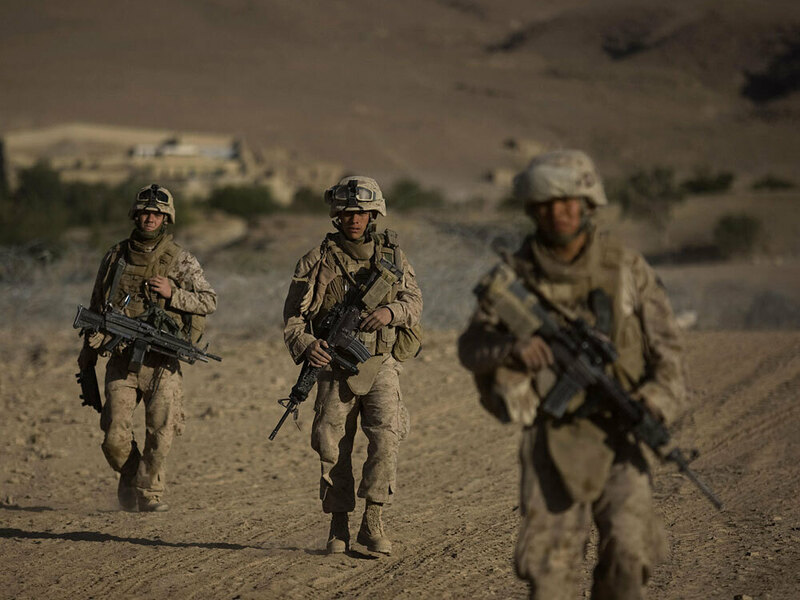 U.S. Marines from Fox Company 2nd Battalion 3rd Marines patrol on the outskirts of their forward operating base, in Farah Province, southern Afghanistan, on September 28, 2009. President Obama has spent most of his young presidency grappling with tremendous challenges, between trying to rescue the struggling economy and pushing for a major overhaul of the country's health care system. But a request from his top general in Afghanistan for more troops sets Obama up for perhaps his most difficult and momentous decision yet. With U.S. troops facing spiraling violence and a growing insurgency, Obama must decide whether to renew America's commitment to the war and boost troop levels by more than 50 percent. The moment is fraught with historical parallels, from Vietnam to Iraq. "It's a test on multiple levels of what kind of leader and what kind of politician and what kind of historian he is," says Richard Norton Smith, a historian who has run four presidential libraries and is currently a scholar at George Mason University. "This is a defining moment, and not only for the president, but for the country." I can assure you that Richard Nixon wanted to fold in Vietnam, but I watched Johnson's war become Nixon's war. This is what will be used very much in the media in dealing with Obama. Obama always knew that Afghanistan was going to loom large for his White House. During his presidential campaign, he pushed for renewed focus on a war that he said his predecessor had neglected for too long. And one of his early steps in office was to order an additional 21,000 U.S. troops into Afghanistan. Now that Gen. Stanley McChrystal, the top U.S. commander in Afghanistan, has told the Pentagon that he needs as many as 40,000 soldiers on top of the 68,000 scheduled to be there by the end of the year, Obama increasingly is being backed into a corner. "This is one whopper of a decision that has to be made," says Stephen Hess, a scholar at the Brookings Institution who served as an adviser to Presidents Ford and Carter. "It could be the first or last line in his entry in the encyclopedia." Even before McChrystal's assessment, the Obama White House was under pressure to do something to fix the war effort in Afghanistan, where violence and U.S. casualties have been rising since the summer. McChrystal has made the stakes clear. "Inadequate resources will likely result in failure," McChrystal wrote in his blunt 66-page assessment of the defects of the current Afghan strategy. For Obama, the general's recommendations are hard to ignore. McChrystal is Obama's own handpicked general, sent over to Afghanistan less than four months ago to refocus the flailing U.S. effort. "It's hard not just because the generals are his, but it's hard because he's a Democrat," says Russell Riley, who leads the William J. Clinton Presidential History Project at the University of Virginia's Miller Center of Public Affairs. "He's a Democrat who to a large part of the public is still suspect on foreign policy credentials, because he doesn't have a lot of demonstrated experience in this arena." Further complicating Obama's decision is the growing tide of opposition to the war among his own Democratic Party, the American people and even some of his own advisers, including Vice President Biden. Obama also has an ambitious domestic agenda, topped by his efforts to overhaul health care. It will be difficult for him to burn up his much-needed political capital on Afghanistan at a time when his own poll ratings are sinking. "Given the diminishing support, you're also confronted with a practical political reality that even a great persuader-in-chief, with all the other arguments he has to make, with all the other issues, with all the other defining moments to come — how much capital does he have?" says Smith. "And how much does he want to spend on a policy that he may not, in his gut, believe in?" Obama says he is still conducting a strategic review of his options in Afghanistan. McChrystal has submitted his formal troop request to the Pentagon, but it has yet to be received by the White House. While some U.S. officials say that Obama is considering a plan to pull back from daily battles with the Taliban to focus more strictly on counterterrorism options, Republicans are pressing him to approve McChrystal's recommendations. "There may be no easy choices, but to think of it as the course of least resistance, which is to just go with the generals, is to underplay his flexibility and simplifies it unnecessarily," says Fred Greenstein, a presidential historian at Princeton University. "There are historical parallels in the form of presidents who didn't ask hard questions," he says, "and their presidencies went down the tubes." Greenstein looks back to Lyndon Johnson, who faced difficult decisions about whether to send combat troops into Vietnam. His predecessor, John F. Kennedy, had resisted such a move, overruling his own military advisers. Johnson ended up authorizing incremental deployments of troops to Vietnam that ultimately dragged the United States into a prolonged, bloody stalemate. "Johnson was concerned that a simple pullout from Vietnam — or, alternately, a major mobilization on the spot — would lead to Congress not acting positively on his Great Society domestic program," says Greenstein. "He kind of played the process along. His administration never did a rigorous assessment of how much it would cost, how long it would take, what the trade-off would be of investing in this, and whether American domestic support would hold up for that period of time." Johnson ended up with the blame for dragging the United States into that war, and his popularity sank so low that he chose not to run for re-election in 1968. When Richard Nixon inherited the war in 1969, he faced a different kind of dilemma as he tried to extricate the United States from Vietnam, says Hess. Despite campaigning on a pledge to bring peace with honor, Nixon found it difficult to bring U.S. troops home without risking an embarrassing defeat. "I can assure you that Richard Nixon wanted to fold in Vietnam, but I watched Johnson's war become Nixon's war," he says. "This is what will be used very much in the media in dealing with Obama." Smith notes that some presidents would have been much better served at times had they been courageous enough to reject the advice of their own experts, whether they were generals or CIA officers. "If John Kennedy's ghost had been consulted, he would say, 'I really wished I had not done the Bay of Pigs.' And I think history would wish he had not, too," Smith says. For George W. Bush in Iraq, however, the lessons were different. When he invaded Iraq in 2003, he ignored the advice of many generals and deployed a relatively small force. The conflict quickly became mired in a deadly sectarian civil war. Several years later, amid sharply rising U.S. casualties, Bush changed strategies. Listening more closely to the generals this time, he implemented the "surge," sending thousands of additional troops to Iraq over the objections of many outside critics. "With his unpopular war, Bush stood up to all of the critics, did his surge, and it did seem to work," says Hess. In Obama's case, the decision has been playing out in public. McChrystal's confidential assessment of how bad things are in Afghanistan was leaked to The Washington Post. Competing leaks have made it clear that many of the president's own advisers are opposed to an escalation. Biden, who was chosen for his foreign policy credentials, is said to be one of the top skeptics. Wherever the leaks are coming from, they could end up helping the president, whichever decision he ends up making. "The more the president is being pulled from a multitude of sides, the more it really is his choice to make, and the more it is a genuine choice," says Greenstein.